Release Date: December 15th, 2006 (Quad Cinema) by Strand Releasing. 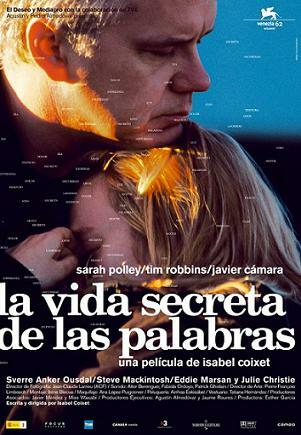 The Cast: Sarah Polley, Tim Robbins, Javier Cámara, Daniel Mays, Eddie Marsan, Steven Mackintosh, Leonor Watling, Julie Cristie. BASIC PREMISE: Hanna (Polley) gradually befriends Josef (Robbins) while tending his burns on an oil rig. ENTERTAINMENT VALUE: The Secret Life of Words takes a while to go somewhere with its slow-moving plot and once it gets to the climactic scene of revelations, it quickly falls apart. Sarah Polley gives a mediocre performance as Hanna, a factory worker who spends her vacation working as a nurse on an oil rig who tends the burns of Josef, a temporarily blind man old enough to be her father. Unlike in the beautiful film Venus, also about a young caretaker who befriends an older man (much older in that case), the May-December relationship here doesn’t feel remotely authentic here. To counter Josef’s blindness, Hanna happens to be partially deaf. The few people on the oilrig, excluding the captain, seem eccentric and have some harsh reality which he or she escapes from by working on the rig. Even the chef (Cámara) has problems of his own as well as the oceanographer who may or may not be a real one because he refuses to say what company he works for. Unfortunately, writer/director Isabel Coixet doesn’t give you any reason to care about these characters and doesn’t develop their relationships in an engaging or coherent way. The awfully stilted last line of the film, when Josef declares that he will figuratively “learn how to swim” in the ocean of Hanna’s troubled life, leaves a bad aftertaste which adds further insult to injury. On a positive note, Coixet includes some beautifully-shot scenes such as one filmed through reflections in a puddle. Admittedly, Hanna’s revealing story about how she had once suffered would have made for a much more interesting movie, but merely observing her and Josef talk to one another and actually say very little until one lengthy scene, feels painfully dull and tedious. INSULT TO YOUR INTELLIGENCE: Dull, tedious and stilted. IN A NUTSHELL: Great cinematography, but often dull, tedious and stilted with mediocre performances.